In bright red with charcoal fabric trim. 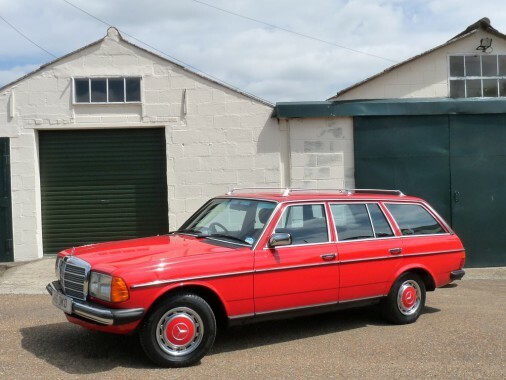 This very special W123 estate started life as a 2.0 litre 200T. It was acquired by a very particular German customer of ours living in London who has a nice collection cars and motorbikes all of which are used regularly and therefore must be just about mechanically perfect. He converted the car to run on LPG as he returns to Germany regularly but the 2.0 litre carburettor engine was underpowered so he set about converting it to 230 E (2.3 litre, fuel injection) specification. The donor engine was stripped, inspected and overhauled including new rings, bearings, seals, a new camshaft and timing chain and tensioner. It was then fitted along with the 230E gearbox and differential but it was discovered that the electrics and dashboard systems were different so the complete dash unit from the donor car was fitted and the wiring and controls adapted as necessary. This work is executed beautifully. The automatic gearbox was rebuilt in March 2015 and a separate oil cooler fitted. The DVLA have been notified of the engine upgrade and the V5 Registration Document carries the correct engine size and number and the correct 230 TE badge is fitted on the tailgate. To all intents and purposes the car is now a 230 TE. The LPG system is an Italian programmable set up and runs beautifully with two tanks and a petrol tank. The boot area is not obstructed and the boot cover and roll up dod guard are still present. The car starts on petrol and then switches over to LPG automatically at 1,400 rpm without need for the driver to do anything. The system comes with a Declaration of Conformity and has done about 8,000 miles. The Mercedes is rustfree and has never been welded. It has wheel arch liners fitted to protect from mud and stones, the driver's seat has been rebuilt so that it no longer sags (a common feature on W123s) and it has a factory fitted manual steel sunroof along with chrome roof bars, a towbar and a C.D. player.